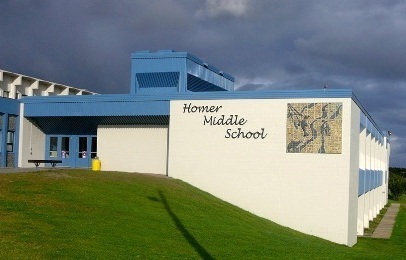 Welcome to Homer Middle School! Mission: Homer Middle School honors students’ diversity by recognizing each individual’s academic and creative potential. HMS promotes high standards through a positive work ethic and encourages students to learn, succeed, and believe in themselves. Thank you for visiting our site. We at HMS work diligently to have a welcoming and positive school climate and culture as well as to ensure every student at our school feels valued. The purpose of our website is to provide resources and information throughout the school year. Please be sure to like us on Facebook as this page is updated often to showcase our students and the exciting activities occurring daily. Also be sure to click on the HMS Prezi to see the 2017-18 school year re-cap. School Safety Closure or Delay Start information: Parents and guardians, school safety is a top priority in the KPBSD. It’s important for you to know what to do before, during, and after a school emergency, weather related delay start, or school closure. Please visit this webpage to familiarize yourself with A.L.I.C.E., KPBSD emergency terms and actions, and how to learn if there will be a two-hour delay start or school closure. http://bit.ly/EmergencyInformationKPBSDIf school remains open due to adverse weather, and you as a parent or guardian assess the conditions in your local area and decide to keep children home, please call the school to let the office know. An absence due to road and weather conditions will be excused.